john4jack (Corvallis, Oregon, United States) on 18 September 2009 in Plant & Nature and Portfolio. Silver Efex Pro does a fabulous job of adding grain. This closes out the Jackson Creek Trail hike. Here I am again. I guess I have to say...I'm back. This is a beautiful image. I really don't want to see the summer months leave us behind. I noticed today that leaves were beginning to fade, and so were all the summer colors. I will take the time to get caught up on the many images I have missed. This one has a wonderful texture feel to it. The color you have chosen is perfect. So sweet... Have a nice day Jack. Yep, great use of grain here. Nicely done. Yes, lovely grain and detail on this fluffy plant. The brown tone, and blur, and feathered light edges showcase this image perfectly! @Dulcie: Thanks, Dulcie. It actually was kind of blah in color. Very delicate look, nicely done. Lovely effect,what a great shot. Tout doux .... Superbe ! Lovely PP, I love the tones and the DOF. 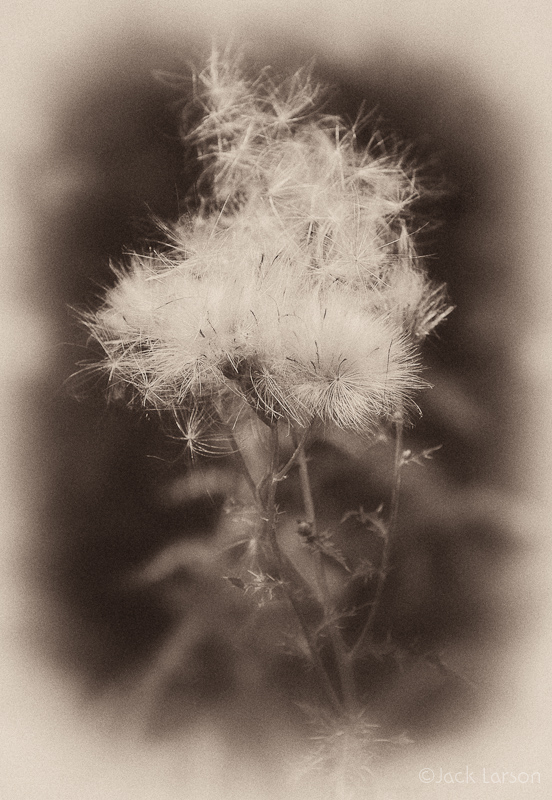 Like the choice of sepia tonality, suits well to the delicacy of the subject. The color toning matches the fluffiness! Great capture! Your processing and framing is ideal for this image. I'd like to throw a puff of air and watch them scatter. Very nice, Jack. I like the muted effect and the color ... a lovely shot and presentation, Jack. Very nice effect and softness on this. I find the wispy nature of this image very appealing. It's enhanced with the fine toning work too. Very well done. a wonderful presentation for a wonderful poetic shot ,jack ! I love these fluffy things and this is really fine image processing! superbe et délicate image, j'aime beaucoup la teinte si douce!!!! les petites graines comme des danseuses à l'assaut du ciel dans le sépia de l'image à l'ancienne.. c'est beau, c'est doux, c'est tendre !! Very nice processing and tones. A very light and airy capture here. At times it looks like the fine cilia of the fluffs are moving. lovely lovely work -- gorgeous processing! !